The idea of bringing a sleeping image back to life by carefully extracting it from an archive brought me to the theme of the multiple reincarnations of the image. Because images are nothing but screens on which we project our identity and our memory, what we are made of. From the found image starts the process of construction of the project through a series of new images. What has become important to me is the dialogue established between the original and the manipulated image, the dialectical image that was so dear to Benjamin. This vortex-image, as Walter Benjamin called it, is not an imitation of things but a line between things; my architect’s thought is slowly built from this separation line. Collages are for me the shape of an idea, the story of a journey, a way of putting thoughts together. There is no rule; there are only directions to be followed. Montage is the ordering principle that produces new images. These new images must be hospitable; they must encourage vision, and establish a relationship with the onlooker. It is important to establish a visual dialogue between the space one wants to represent, the idea that tries to shape it, and the context one tries to build as a background. A skill must be demonstrated in recreating a measurable space, and a precise geometric structure. Which does not form space, but structures it. In other words, when we interpret an image, in fact we are not necessarily looking at it; we are only looking at what that image was meant to show. As soon as the usefulness of the image runs out, we are able to see something else. The image after montage is transformed into something new... when this operation succeeds, it manages to create an estrangement with regard to what is familiar, and it is a transformation and an invention at the same time. Montage takes advantage of this indifference to the original subject, redirecting attention from one side to the other. 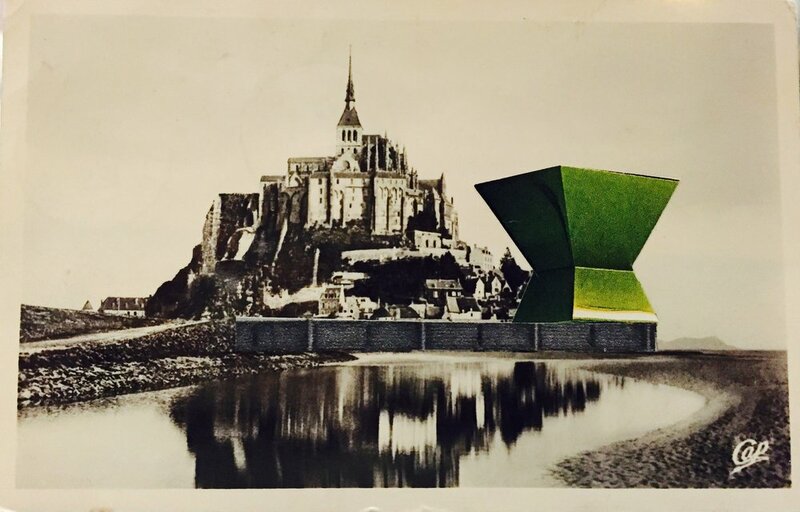 Building an image actually means to build a project... inhabiting worlds that that do not belong to me… the new context and the new frame (let’s not forget that a postcard is actually a window on the real framed for an infinite instant). Inserting a fragment within the image is a way to free up another space, allowing it to reveal itself by breaking the veil of familiarity. Collage allows one to create the conditions for digression, thus stimulating the attention towards what is involuntary. The new frame of reference allows for the image to be imagined, experimented, and thought again. 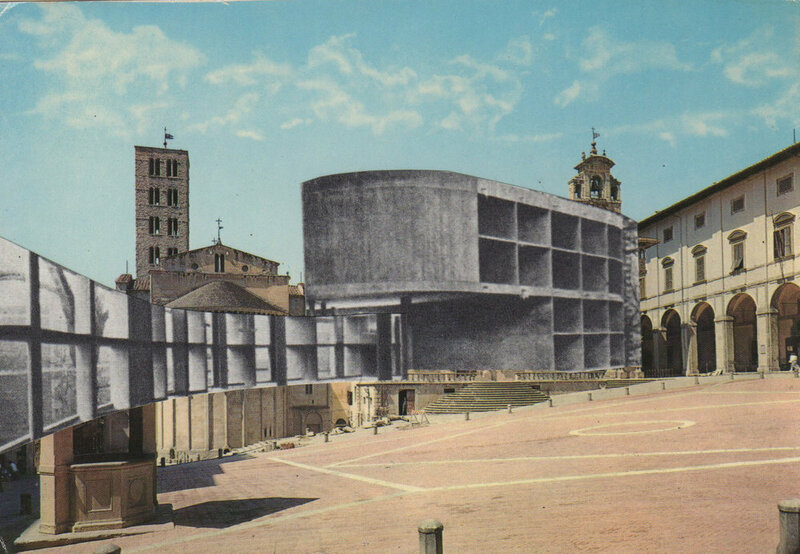 Once the space, and the meaning to be attributed to the image have been suggested, it is necessary to underline the evocative power of the fragment that has been used, in order to grant architecture the power to create a precise identity for the place, identified through the iconic meaning of the building, what I call the construction of an imaginary place. Alternatively, it could be a hybrid place created by grafting pieces of real buildings as well as parts of buildings that have just been imagined. At this point, the conception of time — the time of the image, and the time of montage — becomes crucial. How to evoke time, or rather, how to play with time past by bringing it into the present. The image can create, structure, or confuse times. An image is normally a single frame. There are nevertheless many works that can show different narrative episodes simultaneously. Therefore — as I have already said — I am not so much interested in the image that is the result of montage, but rather in the space between images, which I consider the true space for the mind’s use. This space is the place where the certainty of what I see runs up against the doubt about what I seem to see or to have glimpsed, if only for a moment. It is from this space that images should be observed, in order to be able to assign them a meaning. This device activates spaces of understanding; it creates a physical and mental place, at the same time visible and invisible. In my modus operandi, I try to carry out simple operations, derived from the practice of collage, brought up to date in a dialogue between analog and digital. Many of my montages, in fact, are done by hand and then digitally reproduced. In the moment in which they are reproduced, a catalog of pieces is also established, to be reused several times. In his book Between-the-Images, Raymond Bellour explains this path, which is not based on the construction of the image but on reading the hidden meanings. Through the invention of a new image, which releases itself in part from its photographic transparency to make room for other materials, a new physicality is introduced. The work on disassembly and montage is precisely this — to succeed in creating a physicality of the object-image that, through its defiguration, opens onto a prefiguration. The between-images is that space still new enough to be considered as an enigma, but already structured enough to be circumscribed… a reality of the world that, no matter how virtual and abstract it may be, is a reality of image as a possible world. Montage is a conflict, and as such it is an embodiment of dialectics in images, a dialectic that is always open and never destined to be finally resolved into a synthesis. It is almost entirely improvised, although there is obviously a preparation, and I define the boundaries of improvisation in advance. The part of the work that takes the longest time is the selection of the fragments, which is done before selecting the individual supporting images. When I check details too much, the images never seem good to me. Images and fragments are scattered on a large work desk; the assembly of the pieces takes place gradually; I always work on different images at the same time. It is the urge of the moment that determines my decisions. The images are not the result of a graphic composition, but rather the attempt to understand how to look at them. I always try to bear in mind the project I am working on, because after all the images are not a work in themselves, but they always correspond to my work as an architect. I try to think in images; imagining the transformation of places and buildings makes visible my idea of architecture and the forms that correspond to it. (1) David Campany, Victor Burgin: Other Criteria, in Frieze, no. 155, April 2013. This article is an abridged version of Luca Galofaro’s essay Writing by Images, Thinking by Images. You can download the original text here. Luca Galofaro is a partner at LGSMA which he co-founded with Stefania Manna in 2016. For more collages see The Booklist.